Churches in Cumbria part of the WHITEHAVEN.org.uk web site providing All you need to know about Whitehaven in Cumbria. Hundreds of Whitehaven children flocked to St Beghs Roman Catholic Church on Friday March 4 2005 to pay tribute to their parish priest, Fr Aidan who will be leaving on Monday 14 March after nine years at St Beghs. In a moving and beautiful Joint Schools Celebration Mass pupils of St Gregory and St Patrick Infant School, St Beghs Junior School and St Benedicts High sang and read psalms of their choosing for the mass con-celebrated by Fr Aidan and Fr Luke. 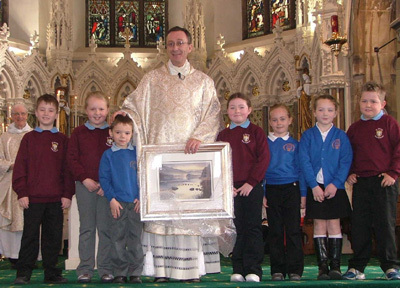 In final tribute pupils of St Benedicts presented Fr Aidan with a picture commemorating the Annunciation and, to remind Fr Aidan of the beautiful Lake District he leaves behind, pupils of SS Gregory and Patrick and St Beghs presented a water colour of Grasmere. In 2003 St James Church celebrated the 250th annivesary of its consecration.. The church was built by Carlisle Spedding and the first vicar was the son of the builder. It has one of the finest Georgian interiors in Cumbria.There is currently an appeal to raise funds for the repair of the churches exterior.